We actually climbed these two peaks on separate days, combined with long drives, but since it took only 1.5 hours to reach the summit of Signal, 2.5 hours for Castle, I decided to write it up as a single-day report. You'd want to start early because there's an hour or so of driving between them. 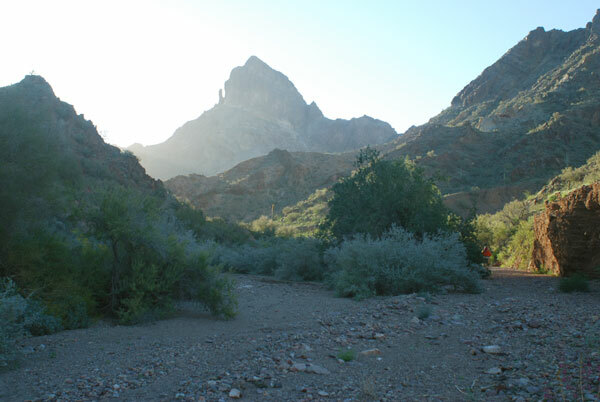 NOTE: The Kofa Wildlife refuge is named after the King OF Arizona mine, shortened to Kofa. 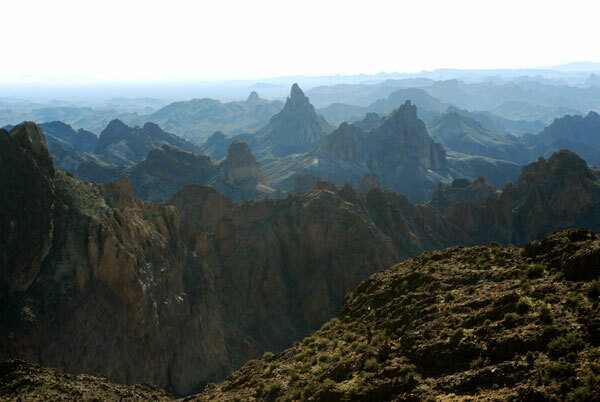 Signal Peak has USGS benchmarks at the top that say Kofa, not Signal. See the trailhead page for waypoints and details of how to reach the eastern trailhead (waypoint SIGETH). Signal can be climbed from the west, but you've either got brushy 5th class or a long walk around the mountain. We drove in at night, but I'd recommend getting there before sunset because it's a beautiful canyon and it looks better in the evening than in the morning. Finding the mouth of Indian Canyon is difficult at night, unless you have a GPS, but it's completely obvious in daylight. We left the 4WD road at waypoint SIGETH around 630am, and was already warm! 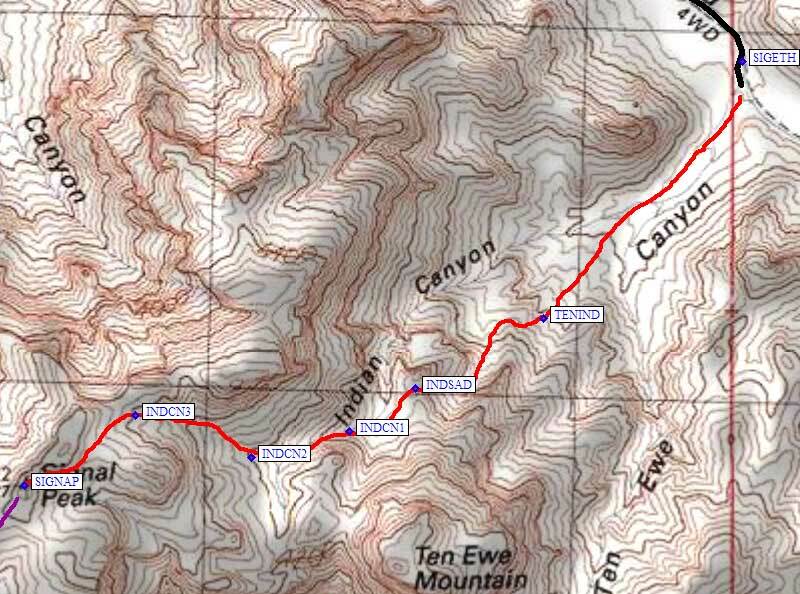 The footing in the canyon (either Indian or Ten Ewe, depending on how you read a topo map) is great. The drainage divides close to the road, and we took the right branch (Indian Canyon). Well, sort of. The easiest climb is on a use trail that somewhat splits the difference between the canyons, climbing up a rib between them to avoid the waterfalls in Indian Canyon proper. Either I read the DPS Guide wrong, it IS wrong, or we climbed by a completely different route that seemed better to us at the time. Don't try to match this description and map too closely to the DPS route! We headed up the rib (waypoint TENIND), then angled slightly right into a small canyon leading up to the saddle at INDSAD. The use trail comes up to this saddle steeply, then traverses around the bowl under Tew Ewe Mtn and continues west toward the false summit of Signal. We never went to the saddle between Ten Ewe and Signal, preferring to stay in the drainage and work around a buttress on the right (waypoints INDCN1-3). It's an easy walk over to Signal Peak, with several BM plaques and a great view. Of course we had to scramble up the false summit to see if it was really shorter, and my altimeter says it's 5 feet shorter. Just about a tie! We were on top by 8am (2000' of gain in under 2 hours - it's not hard going). The register only dated to last year, and we didn't recognize any names in it. See the trailhead page for waypoints and details of how to reach the trailhead we used (waypoint CASDTH). Finding the correct wash is trivial if you have a GPS, but even without it the 'sharp turn' mentioned in the trailhead file should be obvious. We stopped at the Castle Dome Mine museum, easy to find because the dirt road has a stop sign intersection there, but it closes at 5pm so we don't really know if it's worth visiting. The canyon opens up just before CASWSH, and you can see peak from here. There was an elaborate arrow cairn pointing to the small gully leading south from this point, but we didn't take that route. We continued another quarter mile, past the 20' high brown aggregate canyon wall, then turned right (south, at waypoint CASOR1) on easy terrain. We started in a draw, on base rock, and soon located a use trail on a ocatillo-covered rib (waypoint CASOR2). We debated crossing below or above the dark rock outcroppings on our left at CASOR3. We chose the use trail, which stayed left and took us to the base of the summit cliffs. 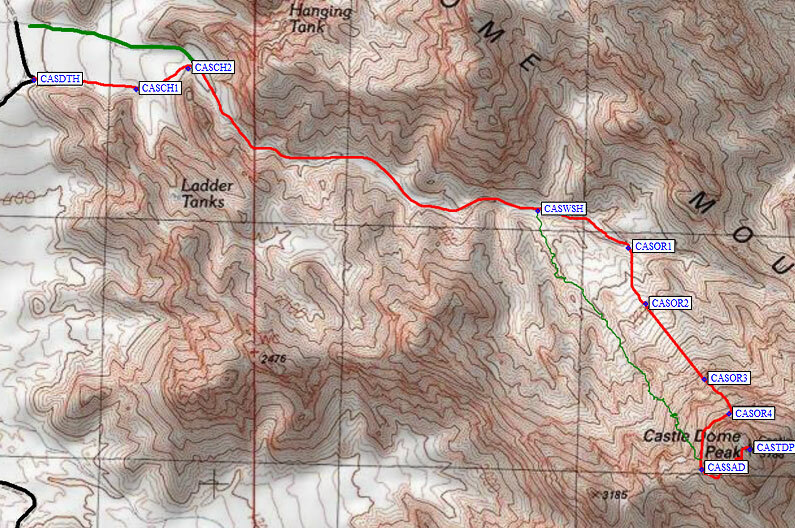 At the cliffs (waypoint CASOR4), on much easier terrain, we turned right (southwest) toward saddle. The great thing about this hike on a hot day is that you're in the shade for almost all of the climbing! We turned a corner onto the summit ridge (waypoint CASSAD) and stepped into sun for the first time since leaving the main wash.
A good use trail goes left (southeast) about 200' from the saddle to the base of the 3rd class section of the route. Turn up at the first tall Saguaro you come to - go straight up, with a lot of switchbacks and even more ducks! The angle eases off as you approach the peak, and we topped out about 2.5 hours after leaving the trailhead. The main curiousity at this summit was a blimp-shaped balloon tethered over the Yuma Proving Grounds, made more interesting by an old pair of binoculars someone had left in the register box. We took different route down, but decided our climbing route was better. If you're interested, see the green line on the map. We went directly to the first giant saguaro below CASSAD, picked our way through boulders, and occasionally saw a use trail. This trail was never as good as the other one, and the footing was sometimes very loose here. The rocks, however, are very colorful! You walk on purple mud rock and yellow mud rock, then descend into a canyon with multi-colored pebbles. This wash comes out at the arrow cairn (waypoint CASWSH).